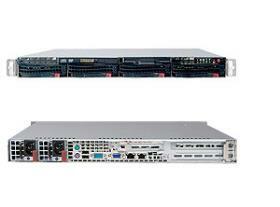 Acme AGD-104TF 1U Opteron 6200/6300 server. This system is good for multi-tasking aplication, like web or VM server. Each CPU controls 8 DIMMs. 2 of PCI-e x8 slots. 1U RackMount case with 560W power supply. option to add 1 or 2 CPU cooling kit. Width: 17.2 in. Height: 1.7 in. Depth: 25.6 in. * add CPU heatsink per processor.